Andrew Hadro was not born into an especially musically inclined family. Nor does he remember why or when he decided to pursue music. He has however, dedicated his life to music and spent thousands of hours honing his abilities, working to expand and push forward instrumental performance. After being born in Mexico City, being shuffled early on in life to Brazil, and stopping for a few years on the east coast, Hadro’s family eventually settled in the Chicago area. He initially began his studies on flute and soon found his way to the baritone saxophone which would become the primary focus of his music. After high school he made the blind leap to New York City and attended the New School for Jazz and Contemporary music. Named Salutatorian in 2007, he left soon after to tour and record with several of the New School Jazz program’s founding faculty members. Hadro has performed around the US and Europe with the Duke Ellington Orchestra, James Moody, the Bjorkestra, Tony Malaby, Chico Hamilton, and Junior Mance, among many others. He is active in the New York music scene and involved in several projects including performances with his own groups. He is a director of the Litchfield Jazz Camp, maintains an active private lesson studio, and works as a Product Specialist for Vandoren. 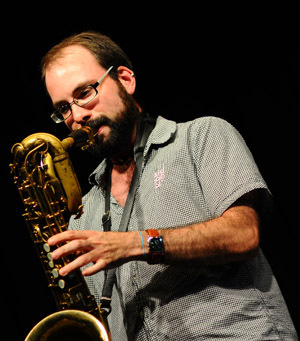 He is also currently the curator of JazzBariSax.com, a website dedicated to the baritone saxophone. Andrew Hadro and his group are available for performances of all kinds. Please contact him directly at booking@andrewhadro.com for more information.